In his fifties, Michael Gates Gill had it all: a mansion in the suburbs, a wife and loving children, a six-figure salary, and an Ivy League education. But in a few short years, he lost his job, got divorced, and was diagnosed with a brain tumor. With no money or health insurance, he was forced to get a job at Starbucks. Having gone from power lunches to scrubbing toilets, from being served to serving, Michael was a true fish out of water. But fate brings an unexpected teacher into his life who opens his eyes to what living well really looks like. The two seem to have nothing in common: She is a young African American, the daughter of a drug addict; he is used to being the boss but reports to her now. For the first time in his life he experiences being a member of a minority trying hard to survive in a challenging new job. He learns the value of hard work and humility, as well as what it truly means to respect another person. Behind the scenes at one of America’s most intriguing businesses, an inspiring friendship is born, a family begins to heal, and, thanks to his unlikely mentor, Michael Gill at last experiences a sense of self-worth and happiness he has never known before. My thoughts: I just love how book suggestions come about in life. I frankly would have never known about this wonderful little book had a friend not suggested it to me after one of my Facebook posts that went something like this: “You know the thought of being a full time Starbucks barista is looking better and better by the day.” And hence my journey with the wonderful, inspirational story began. The premise is simple, a high-tech advertising executive with plenty of money, all the right friends, the beautiful home, the perfect family finds his true happiness after losing it all and becoming a barista at Starbucks. An absolutely wonderful riches to rags story that serves as an inspiration to all of us who strive to live the “perfect” life. 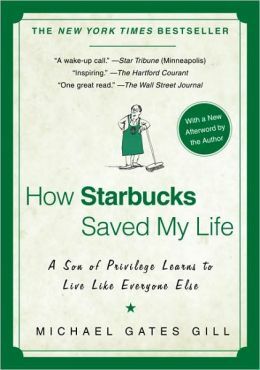 I truly enjoyed the authors style of mixing in the details of his “past” life with his current life at Starbucks and in doing so not focusing too much on the past life. If he had focused too much on that “past” life inclusive of, let’s face it a lot of name dropping (having met Ernest Hemingway, Jackie Kennedy, Frank Sinatra, and the list goes on), it would have seemed that the author was ultimately quite cocky and hadn’t really learned from his new experience. I also really enjoyed the simplicity of the book. It is a super fast read (I finished it in 2 days) that merely shares one man’s journey from rich and successful to poor but extremely happy. I highly recommend this book to anyone. It is full of wonderful kernels of truth if you will that inspire, motivate, and set priorities straight. The wars of the past decade have been covered by brave and talented reporters, but none has reckoned with the psychology of these wars as intimately as the Pulitzer Prize-winning journalist David Finkel. For The Good Soldiers, his bestselling account from the front lines of Baghdad, Finkel embedded with the men of the 2-16 Infantry Battalion during the infamous “surge,” a grueling fifteen-month tour that changed them all forever. In Finkel’s hands, readers can feel what these young men were experiencing, and his harrowing story instantly became a classic in the literature of modern war. In Thank You for Your Service, Finkel has done something even more extraordinary. Once again, he has embedded with some of the men of the 2-16—but this time he has done it at home, here in the States, after their deployments have ended. He is with them in their most intimate, painful, and hopeful moments as they try to recover, and in doing so, he creates an indelible, essential portrait of what life after war is like—not just for these soldiers, but for their wives, widows, children, and friends, and for the professionals who are truly trying, and to a great degree failing, to undo the damage that has been done. The story Finkel tells is mesmerizing, impossible to put down. With his unparalleled ability to report a story, he climbs into the hearts and minds of those he writes about. Thank You for Your Service is an act of understanding, and it offers a more complete picture than we have ever had of these two essential questions: When we ask young men and women to go to war, what are we asking of them? And when they return, what are we thanking them for? My thoughts: This book came to my attention through one of many of the book newsletters I get via email. This book particularly intrigued me as I had literally just come home from doing some presentations/drum circles at a retreat weekend for the military Gold Star Families. For those that aren’t familiar with this, these are families who have lost loved ones while on active duty. As part of the weekend, during the opening session each family had a chance to stand up and share a bit about the family member that they lost. After hearing stories from 41 different family members, including many more military suicides that I had imagined, and walking around the perimeter of the room where there were tables where each family member had a space to share pictures, mementos, etc of their loved one – it was impossible to not be effected by the experience! Having just had that experience, I found this book fantastic! This book is a follow up of David Finkel’s first book, “The Good Soldiers” where the author, a reporter with the Washington Post, embedded himself with a battalion during their time in Iraq, Afghanistan. I haven’t read this first book yet, but I got it from the library today! In “Thank You for Your Service”, Finkel once again embeds himself with members of the 2-16 battalion, however this time it is back here in the States as the soldiers come back from war and deal with the effects of war – namely PTSD, physical problems, psychological problems. The book is powerful, poignant, and no doubt timely! The book traces a number of soldiers, families, and helping professionals as they deal with PTSD, suicidal behavior, the struggle to get the proper mental health care, and the effects on the families when they return. What I loved about the book, besides clearly the subject matter, is that the author not only gives the accounts of the soldiers attempting to reenter “real life” after war, but also gives the perspective of their family members and a number of healthcare/helping professionals who try their best to help these soldiers in a system that is often flawed. I also love that the book made me uncomfortable! I love when books challenge my beliefs and images of how I want the world to work. 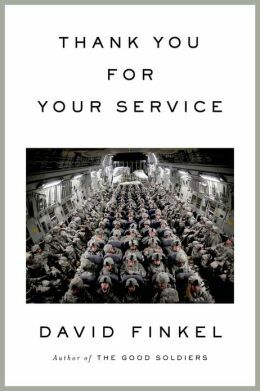 As much as it is wonderful that we show in the media the wonderful images of people and families greeting their military loved ones at the airport, hugs, tears, and we like to imagine that everything goes back to completely normal in these people’s lives – this book will give you the real story about post-deployment, reentry struggles. Kudos to the author for showing us the cold, harsh, true reality. I also love that this book made me ask questions to myself and empowered me that I/we need to do more. Are you serious, it is that hard for returning soldiers to get the mental health care they need? Are you serious, this guy took bullets for me in war and now can’t get the care he needs? What more can I do? What more can we do? I am not a very political person and certainly don’t like getting political in public forums, however I think this book is a must read no matter what side of the war debate you are on. The reality is that there are thousands of men and women fighting for their country in any number of places and are coming home not the same people that they left. What can we do? How can we make a difference? I highly recommend this book! Please read it! I think that every reader of this book is somehow effected and hopefully is empowered to ask themselves what they can do.